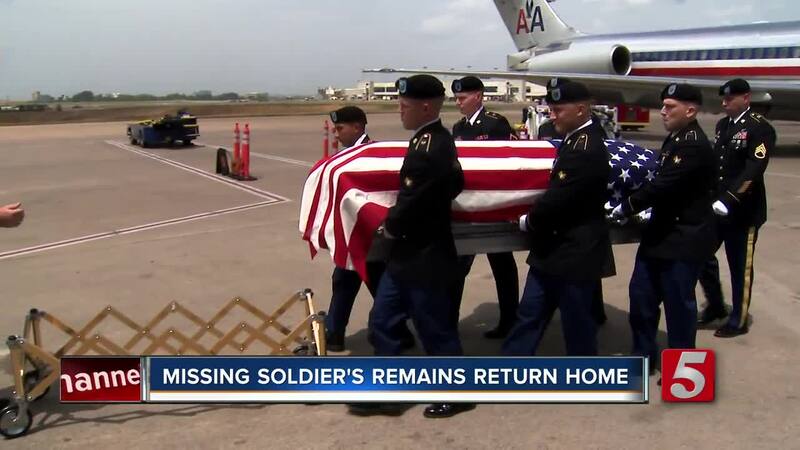 The remains of a Kentucky soldier who went missing in 1950 during the Korean War have been returned home. Pfc. Joe Stanton Elmore was 20 when he died on Dec. 2, 1950, in Changjim County, Hamgyeong Province, North Korea. The Defense POW/MIA Accounting Agency, which keeps a record of missing American soldiers, announced Elmore's identification on July 3. He was a member of the 7th Infantry Division and one of about 2,500 U.S. soldiers assigned to the 31st Regimental Combat Team, also known as Task Force MacLean and Task Force Faith. On Wednesday afternoon, family members met the plane at the airport. They placed their hands on the casket, waved American flags, and cried. Lester Baety never met his uncle as Elmore was missing for 67 years. "It's a hometown hero coming home," said Baety. Mary Bowlin, 83, is Elmore's sister. She never thought she'd be able to formally say goodbye. "Now that it's here, we're going to cherish it, thank God," said Bowlin. "My mother would look for him every day, and she did say he'll be coming one of these days." She was 15 years old when he left to fight in the Korean War. "There was a big void there but I had dreams. I still had dreams that he would come home some day," Bowlin said. In December of 1950, soldiers showed up to their Kentucky home to report that Elmore was missing. They were able to identify Elmore through DNA testing. "Me and my sister that was alive at the time, we gave our DNA and we was hoping. You always hope," said Bowlin. Her nephew, Lester, was glad to know that their family could finally have real closure, saying "She can finally lay her brother to rest beside her brothers and sisters and her mom and dad." Bowlin agreed, saying "I feel closure, I feel completeness. We're going to get to have him a Christian burial finally after all these years." One of the soldier's family members, a marine, was on the flight and stayed with the remains. Law enforcement officers and motorcyclists escorted the hearse down I-40. Elmore will be laid to rest in Albany, Kentucky at a family cemetery. Family members described him as a Christian who loved music. He felt like going to war was his duty because he loved his country.